In Part 1, we described the basics of high-performance liquid chromatography (HPLC) sample testing. Today, we’ll discuss another common technique: gas chromatography (GC). As mentioned in Part 1, chromatography is a method to separate chemical mixtures. However, instead of high-pressure liquids, which HPLC uses, GC relies on heat and vaporization to move molecules along a column. GC systems are quite affordable. You can buy one for $1,000 or so; compare that to an HPLC instrument, which can run in the tens of thousands of dollars. 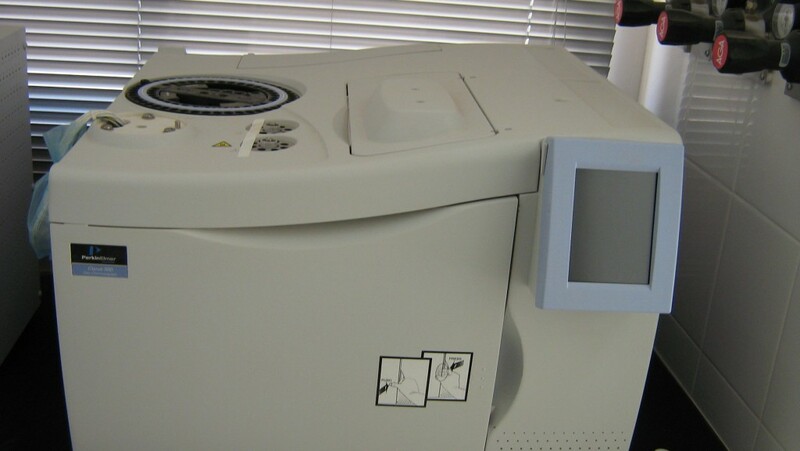 GC systems are also much simpler and easier to operate than HPLC. Any first-year chemistry student can operate a GC system, while an HPLC instrument requires a skilled chemist. Chances are that you’re not a chemist. But that’s no problem: You’re sending these samples off to labs, so there’s no need for you to process them. The first step of a GC analysis works a lot like HPLC. Let’s assume we send a gram of bud. Chemists crush it up, drop it in a vial, mix it with some chemical solutions, then filter out the solid matter from the liquids. Next, they draw up the liquid in to a special syringe. This syringe has a needle. Chemists literally inject the sample, through the needle, into a port fixed on the front of the GC instrument. This requires a bit of finesse, but once our sample is in, they run the GC. The third step is where the GC takes over. It uses heat to vaporize the liquid sample with the bud’s cannabinoids, terpenes and so on. Since there’s a lot of heat, GC can’t use liquids to push all these little molecules across the column as with HPLC. So, instead, chemist use an inert or non-reactive gas like nitrogen to push these molecules along. The gas and sample vapors travel through a metallic coil—which we call a column, although this is a different kind of column than in HPLC. As the gas travels, the separation begins. Just as with HPLC, the components of the gas separate based on the molecules’ weights, sizes and electrical charges. Smaller molecules move along the column faster than larger molecules. Also like HPLC, chemists need a detector to measure the amounts of molecules in the sample. However, because of all the heat involved, light doesn’t work well in GC analysis. So, one typical detector that you’ll find on GC equipment is the flame-ionization detector (or FID). This detector uses a small flame (about the size of a candle’s) to incinerate the molecules after separation. Any molecule that’s burned releases electrons, which generate an electric current through the flame. Using some math, chemists can determine how many molecules of THC, CBD, or other cannabinoids that were in our sample based on the currents that the FID picks up. Another detection method is mass spectrometry, which chemists call “mass spec” or “MS.” This detection method is pretty complex, but what it basically does is blast the molecules with electrons. As the molecules break apart, they create “fragments.” These fragments are always the same (because we’re looking for the same molecules). The fragments float through an electromagnetic field, and that field can tell us what we’re looking at. By sensing what fragments are made, the detector can tell us how much of what stuff was in our sample. Next time, we’ll discuss sampling techniques.